Pura Besakih is a temple complex in the village of Besakih on the slopes of Mount Agung in eastern Bali, Indonesia. It is the most important, the largest and holiest temple of Hindu religion in Bali, and one of a series of Balinese temples. Perched nearly 1000 meters up the side of Gunung Agung, it is an extensive complex of 23 separate but related temples with the largest and most important being Pura Penataran Agung. The temple is built on six levels, terraced up the slope. 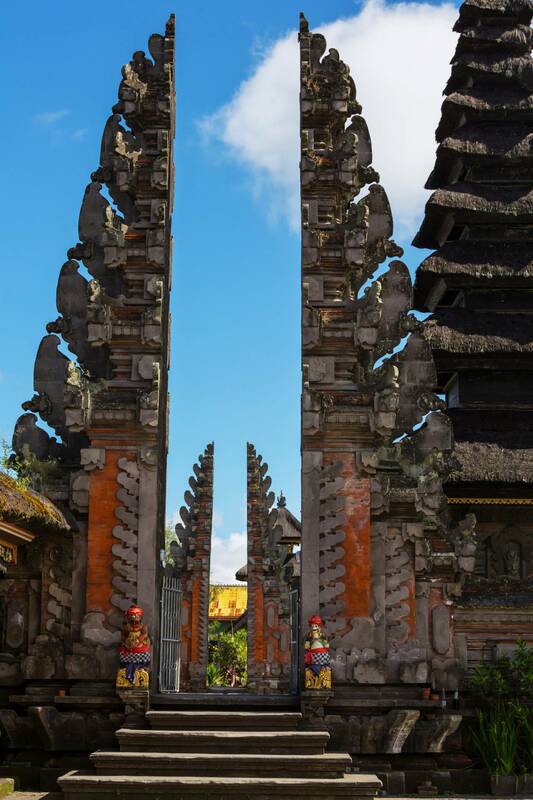 The entrance is an formed by a Candi Bentar, and beyond it the Kori Agung is the gateway to the second courtyard. The precise origins of the temple are not clear but it almost certainly dates from prehistoric times. The stone bases of Pura Penataran Agung and several other temples resemble megalithic stepped pyramids, which date back at least 2000 years. 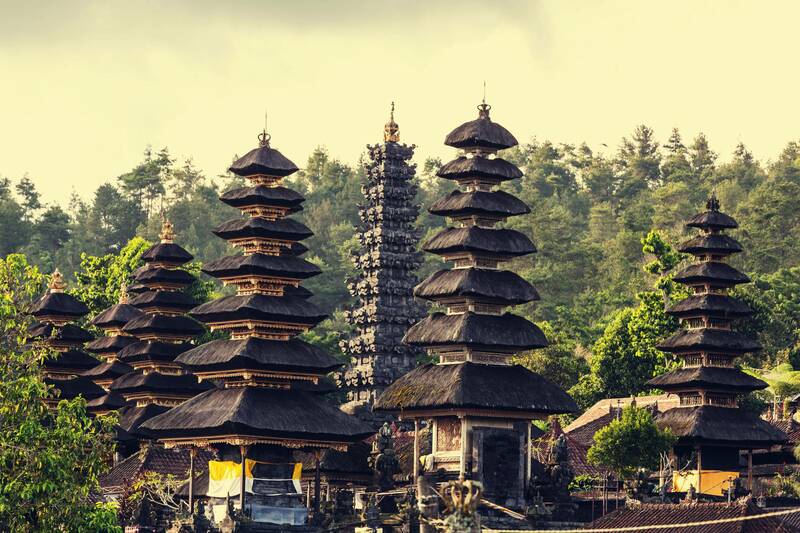 It was certainly used as a Hindu place of worship from 1284 when the first Javanese conquerors settled in Bali. By the 15th century, Besakih had become a state temple of the Gelgel dynasty. It was built on the south slopes of Mount Agung, the principal volcano of Bali. 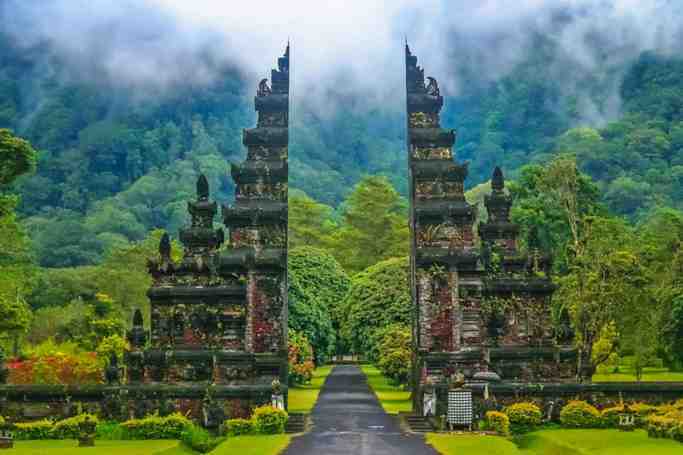 Pura Besakih is a complex made up of twenty-three temples that sit on parallel ridges. It has stepped terraces and flights of stairs which ascend to a number of courtyards and brick gateways that in turn lead up to the main spire or Meru structure, which is called Pura Penataran Agung. All this is aligned along a single axis and designed to lead the spiritual person upward and closer to the mountain which is considered sacred. The main sanctuary of the complex is the Pura Penataran Agung. The symbolic center of the main sanctuary is the lotus throne or padmasana, which is therefore the ritual focus of the entire complex. It dates to around the seventeenth century. A series of eruptions of Mount Agung in 1963, which killed approximately 1,700 people also threatened Pura Besakih. The lava flows missed the temple complex by mere meters. The saving of the temple is regarded by the Balinese people as miraculous, and a signal from the gods that they wished to demonstrate their power but not destroy the monument the Balinese faithful had erected. Each year there are at least seventy festivals held at the complex, since almost every shrine celebrates a yearly anniversary. This cycle is based on the 210-day Balinese Pawukon calendar year. Visitors to this temple should exercise caution as there is a syndicate operating in and around the premise of this temple. They target tourists by offering a compulsory "tour guide" at exorbitant charges. They also perform "prayers" and request for tips at the end of the "tour". Visitors who decline their "services" are dealt with rather aggressively. Pura Besakih | eTips Inc.